This colorful anatomical chart presents useful information about hypertension. 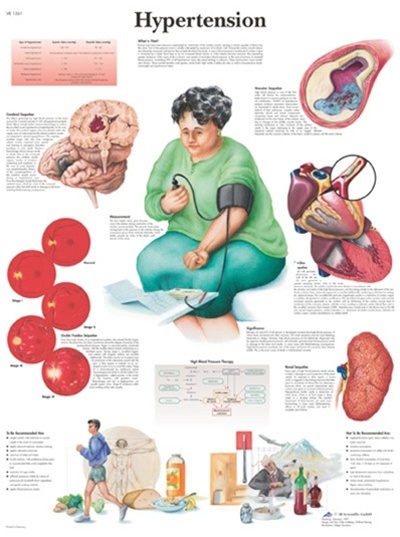 The effects of hypertension on organs of the human body are also shown on the poster as well as things to avoid and things to do to help hypertension. The Hypertension STICKYchart™ is a valuable tool for health education and patient education! 3B Scientific STICKYcharts™ are printed in full color on durable vinyl with a 3M™ adhesive backing. The non-destructive adhesive affixes to walls, doors, windows, whiteboards, metal, cabinets and most any clean surface. Can be removed and re-affixed to surfaces many times. CLICK VIDEO BELOW to see a demonstration of the new STICKYchart design.